In the year 1969, Rosai and Dorfman described 4 cases of a disease called sinus histiocytosis with massive lymphadenopathy (SHML). Later in 1972, they analyzed 30 additional cases, establishing SHML as a clinic-pathological entity. It occurs world-wide and is primarily a disease of childhood and early adulthood. Mean age of onset is 20 years. Rosai-Dorfmann syndrome (RDS) manifests with massive cervical lymphadenopathy, fever, leukocytosis, an increased erythrocyte sedimentation rate (ESR), and hypergammaglobulinemia. Other lymphatic groups, such as mediastinal, axillary and inguinal lymph nodes can also be affected. In about 25-40% of cases, extra nodal sites are also affected. ,, The concomitant involvement of one or more sites in the same individual is observed in 44.7% of cases. The common sites for extranodal involvement are skin, mucosae, spinal cord, pancreas. Extra-nodal involvement is often responsible for the most important clinical manifestation of the disease. Castleman's disease, dermopathic lymphadenitis, mucocutaneous lymph node syndrome (Kawasaki disease), histiocytic necrotizing lymphadenopathy (Kikuchi disease) and inflammatory pseudotumor of the lymph node are among the other rare causes of lymph node enlargement. RDS is one more addition to this list, whose etiology remains poorly elucidated. The diagnosis is based on presence of emperipolesis and immunohistochemistry. Its treatment is poorly defined but the prognosis is usually favorable and treatment strategies can be different according to severity or vital organ involvement. The present case report is about a 32-year-old female attended to our outpatient department with the complaints of recurrent fever, joint pains and multiple swellings all over the body and left periorbital swelling since last 7 years [Figure 1]. The lesions had been progressively increasing in size and number. On dermatological examination multiple tender erythematous indurated subcutaneous plaques noted on anterior abdominal wall, labia majora, right thigh, left buttock and left leg [Figure 2]. Plaques were tender, firm in consistency, varied in size from 5 to 8 cm in diameter. In addition, she also had left periorbital swelling and bilateral inguinal lymphadenopathy-discrete, mobile, firm, non-tender, 1-2 in number, 1.5 cm in size. No other lymph nodes were enlarged. Systemic examination was unremarkable. The presumptive diagnosis was made as panniculits. Laboratory findings included leukopenia, mild microcytic hypochromic anemia and elevated ESR 60 mm/h. Chest X-ray was normal. Fine-needle aspiration cytology (FNAC) from swelling in the mid-thigh and left inguinal region revealed a picture predominantly composed of spindle cells, histiocytes with vesicular nuclei and moderate to abundant eosinophilic cytoplasm seen in small clusters and scattered individually [Figure 3] and [Figure 4]. Many of them contain lymphocytes and plasma cells consistent with emperipolesis. No evidence of neoplasm or any specific inflammation. The features were consistent with RDS. Histopathology showed foamy cell histiocytosis and lymphocytophagocytosis. Immuno-histochemistry and serum electrophoresis couldn't be done due to non-availability in our institute. RDS shows a world-wide distribution and can manifest in any age group. Nearly 81% of reported cases occur during the first and second decades of life and has a 2:1 male-to-female ratio. The predominant clinical manifestation of the disease is massive cervical lymphadenopathy (87.3%), which in most cases, is painless and bilateral, affecting one or all cervical chains. The inguinal (25.7%), axillary (23.7%), and mediastinal (14.5%) regions can also be affected. Fever occurs in up to 30% of cases. Extra-nodal RDD can affect every organ; most common sites are skin (27.4%), nasal and paranasal cavities (26.8%), subcutaneous tissue (22.2%), orbit and eyelids (20.1%) and bone (18.4%). Laboratory alterations are frequent and include anemia (65.7%), leucocytosis (59.1%), neutrophillia (68.4%), increased ESR (88.5%) and hypergammaglobulinemia (90%). Purely cutaneous RDD is indeed quite rare, and often assume a spontaneously involuting course. Previous reports on cutaneous manifestations of RDD by Thawerani et al. and Chu and LeBoit  revealed a wide range of clinical presentations, such as exfoliative dermatitis, scaly erythematous lesions mimicking psoriasis, and pinhead-sized papules. RDD has long been considered a reactive process; however, the etiology remains unclear. Immune deficiency and viral infection by Epstein-Barr virus  human herpes virus 6 , or parvovirus B19 , have been implicated as potential players in pathogenesis. A cytokine-mediated migration of monocytes may be involved in histiocytes accumulation and activation. On morphological ground, recognition of cutaneous RDS should consider a variety of diseases in the differential diagnosis, including eruptive xanthoma, Tangier disease, Langerhans cell histiocytosis, reticulohistiocytoma, juvenile xanthogranuloma, lepramatous leprosy, Hodgkin's lymphoma, malignant histiocytosis, as well as inflammatory pseudotumours. RDD is rare, especially in Indian subcontinent. Physicians need to have a high degree of suspicion in patients presenting with generalized lymphadenopathy, with or without extranodal involvement, to diagnose RDD. S100 positive immunohistochemical staining clinch the diagnosis in favor of RDD. In summary, we present a rare case of RDD involving skin and periorbital area in a middle age woman, with inguinal lymphadenopathy, anemia, leucopenia, raised ESR, FNAC  and histopathological report consistent with emperipolesis. Owing to its rarity at this location, it is crucial to include RDD in the differential diagnoses of an extranodal histiocytic lesion to avoid misdiagnosis. The authors would like to thank General Medicine Department, Siddhartha Medical College, Vijayawada. 1. Rosai J, Dorfman RF. Sinus histiocytosis with massive lymphadenopathy. A newly recognized benign clinicopathological entity. Arch Pathol 1969;87:63-70. 2. Foucar E, Rosai J, Dorfman R. Sinus histiocytosis with massive lymphadenopathy (Rosai-Dorfman disease): Review of the entity. Semin Diagn Pathol 1990;7:19-73. 3. Sanchez R, Rosai J, Dorfman RF. Sinus histiocytosis with massive lymphadenopathy. 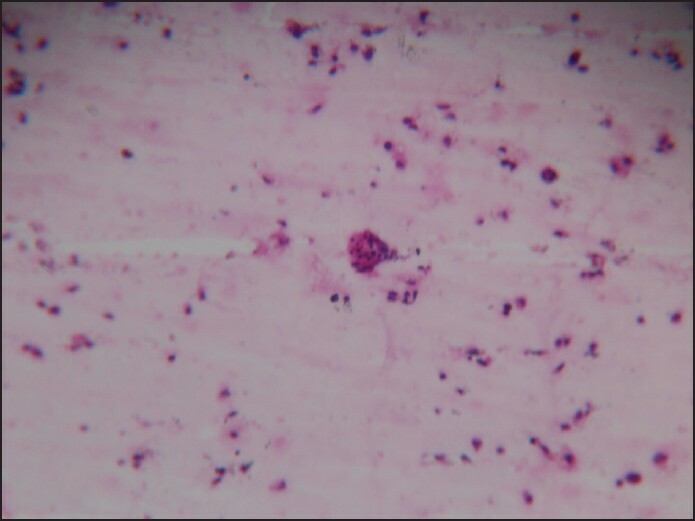 An analysis of 113 cases with special emphasis on its extranodal manifestation. Lab Invest 1977;36:21-2. 4. Goodnight JW, Wang MB, Sercarz JA, Fu YS. Extranodal Rosai-Dorfman disease of the head and neck. Laryngoscope 1996;106:253-6. 5. Bhaskar V, Swamy K, Reddy BK, Supe SS, Kumar RV. Sinus histiocytosis with nodal and extranodal involvement - A case report. J Indian Med Assoc 2003;101:28-30. 6. Warnke RA, Weiss LM, Chan JK, Cleary ML, Dorfman RF. Atlas of Tumor Pathology. Tumors of the Lymph Nodes and Spleen. AFIP, 3 rd Series, Fascicles 4. Washington, DC, USA: Juan-Rosai; 1994. p. 349-59. 7. Thawerani H, Sanchez RL, Rosai J, Dorfman RF. The cutaneous manifestations of sinus histiocytes with massive lymphadenopathy. Arch Dermatol 1978;114:191-7. 8. Chu P, LeBoit PE. Histologic features of cutaneous sinus histiocytosis (Rosai-Dorfman disease): Study of cases both with and without systemic involvement. J Cutan Pathol 1992;19:201-6. 9. Tsang WY, Yip TT, Chan JK. The Rosai-Dorfman disease histiocytes are not infected by Epstein-Barr virus. Histopathology 1994;25:88-90. 10. Levine PH, Jahan N, Murari P, Manak M, Jaffe ES. Detection of human herpesvirus 6 in tissues involved by sinus histiocytosis with massive lymphadenopathy (Rosai-Dorfman disease). J Infect Dis 1992;166:291-5. 11. Luppi M, Barozzi P, Garber R, Maiorana A, Bonacorsi G, Artusi T, et al. Expression of human herpesvirus-6 antigens in benign and malignant lymphoproliferative diseases. Am J Pathol 1998;153:815-23. 12. Mehraein Y, Wagner M, Remberger K, Füzesi L, Middel P, Kaptur S, et al. Parvovirus B19 detected in Rosai-Dorfman disease in nodal and extranodal manifestations. J Clin Pathol 2006;59:1320-6. 13. Sarwal R, Tu E, Mendelblatt FI, Sugar J, Gross SA, Pulido JS, et al. Atypical ocular presentations of Rosai-Dorfman disease. Ocul Immunol Inflamm 2008;16:9-15. 14. Komp DM. The treatment of sinus histiocytosis with massive lymphadenopathy (Rosai-Dorfman disease). Semin Diagn Pathol 1990;7:83-6. 15. 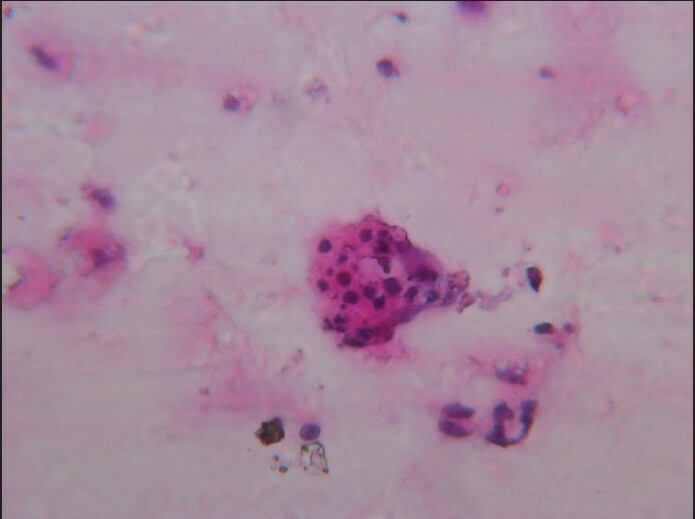 Kumar B, Karki S, Paudyal P. Diagnosis of sinus histiocytosis with massive lymphadenopathy (Rosai-Dorfman disease) by fine needle aspiration cytology. Diagn Cytopathol 2008;36:691-5.